Back in 2008, when my work concentrated on unwritten rules and media endorsed expectations, I created a print series entitled Two Months Salary. 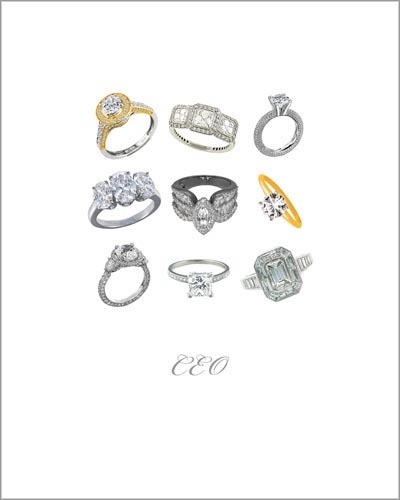 This series is made up of 20 10″ x 8″ prints, each displaying the name of an occupation and nine engagement rings. I collected data on the average salaries of several occupations (Farmer, Police Officer, Dentist, A List Actor, etc.) 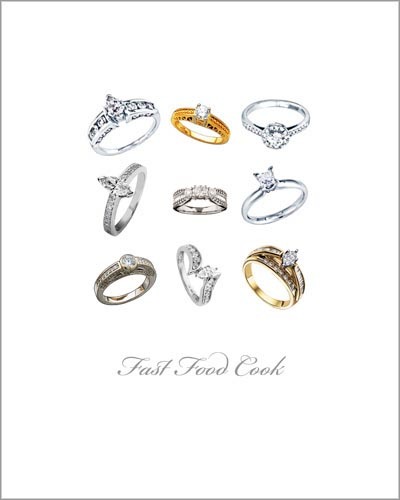 and then found nine rings that, according to Debeers, that person should purchase if they want their love to taken seriously by modern western society. The prints were made, people enjoyed them, and then I moved on. In May of 2006, a female Sunday Morning reporter went out on the streets of New York City to ask passers-by what they thought about her 3/4 carat diamond solitaire engagement ring. ”It says that he tried his best… but that it wasn´t good enough,” said one lady. “Well, its fine… for a friendship ring,” replied another. Another bystander replied that “you need a magnifying glass to see it.” The diamond engagement ring has evolved from a luxury item mostly purchased by the wealthy to a must have for any bride-to-be. In 1947, DeBeers began a marketing campaign to increase diamond sales, hoping to cash in on a growing post-war economy. Jewelers began using the guideline of two months salary as a standard. This campaign has been so successful that we now, as a society in general, equate a man´s personal worth and love for his future spouse with the size of a shiny rock. For many, size matters. If you visit WeddingChannel.com, you will find a ring budget tool that determines what you should spend. It divides your annual salary by 6 to come up with the “standard” two month guideline. Using this equation, along with the most recent average salary data gathered from the US Dept. of Labor and Payscale.com, I created a list of average salaries for a range of occupations. Images of rings were allocated to each occupation by price. There are 20 separate prints in this piece, each representing a specific occupation with 9 rings that, according to the jewelry industry, are the standard for that particular occupation´s salary. You can view all of the prints here at my website. So I did more research, wrote an essay, designed a cover, and created 42 more pages of occupations with their rings and thus Two Months Salary: the book was born. It is available on Amazon. The book was a new experience (would do again) and became a mild success. During my research, I found a video of a young enlisted Marine prepping to ask his girlfriend to marry him. He showed the receipt for the ring (11K+) before displaying the ring. I thought that said a lot! I also discovered where several jewelry sites touted loan programs… in case you didn’t have two months salary on hand at that time. DeBeers.com had a two months salary calculator right on the front page. I was somewhat stunned but mostly amused. Book completed, I moved on. Fast forward to 2011 and the call for Decathlon Artist/athletes appeared. I decided to enter but I wanted to have some sort of overall theme. I choose my Two Months Salary work as a catalyst. It had already been a print series and a book, can I morph it into nine more mediums? I liked that challenge. I believe that I met that challenge. I am happy with the works I created. They meet my aesthetic expectations and have an edge of humor about them. The painting for the Decathlon, Three Proposals, is an example of the process I am using now. Where before I considered myself open to use any medium warranted by my concepts, I now consider myself a painter. Having spent six months on all these decathlon pieces in all those very different mediums underscored my desire to become a more medium focused artist. And now I move forward. I plan to have my new work on a new site within the next month or so. If you are curious, feel free to visit. Hope you enjoy my works and all the pieces from the Decathlon artists. The show closes on Feb. 5th so hurry on over before it’s gone! You are currently reading All about the Bling… at .